Taste the flavours of the ocean in this seafood bouillon recipe, fresh from the North Island Kitchen. Heat a heavy-bottomed saucepan with oil and fry the onions until slightly golden. Add the ginger and garlic and gently fry for a few seconds, taking care not to burn it. Now add the chopped tomatoes, chilli, fresh thyme and bay leaf. Cook on a medium heat until the tomatoes and onions have cooked into a paste. Then add the fish stock, lime segments and bilimbi and season with salt and pepper. Simmer for a few minutes until it has reduced by about a third, then add your fish and poach gently until cooked to your liking. Pan sear the Red Snapper and season with lemon juice, then grill the octopus and King prawns. 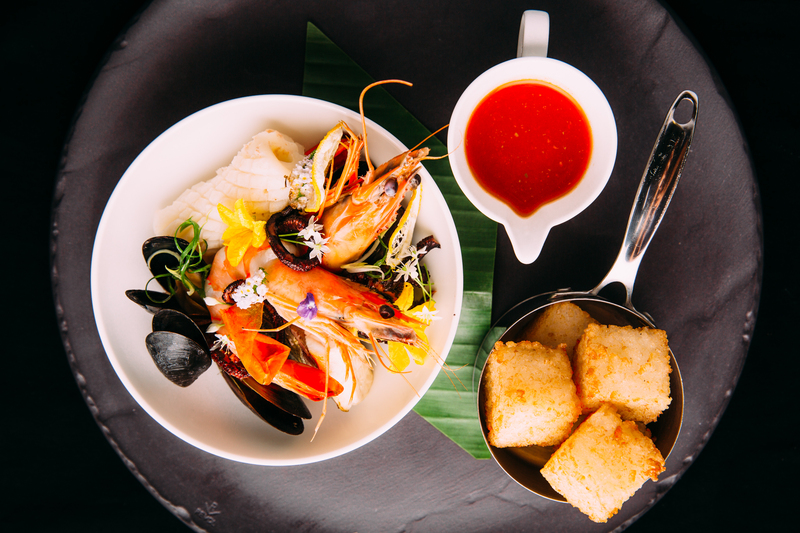 When plating, arrange the seafood in a bowl and pour over the bouillon.